It was a night to remember — sophisticated and chic ensembles, movie style glamor, international flair. Trendy Lime’s 2010 Casablanca party was one of our most elegant social networking events ever, and we’re bringing it back for 2012! 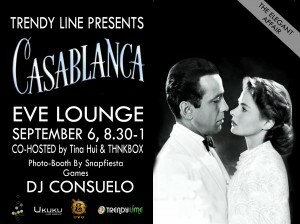 Channel the spirit of Bogey or Bergman at San Francisco’s Eve Lounge venue on September 6 and be prepared to rub shoulders with fashionable jetsetters and chic movie buffs alike. You may not have Paris, but you’ll always have Trendy Lime! The Casablanca event will have all the cool elements that you’ve come to expect from Trendy Lime’s exclusive social networking parties. In addition to the chance to mingle with San Francisco’s most influential movers and shakers, you’ll be able to partake in party games, strike a pose or ham it up in SnapFiesta’s photo booth, indulge in Casablanca-inspired drink specials, and dance to trendy tunes by DJ Consuelo.